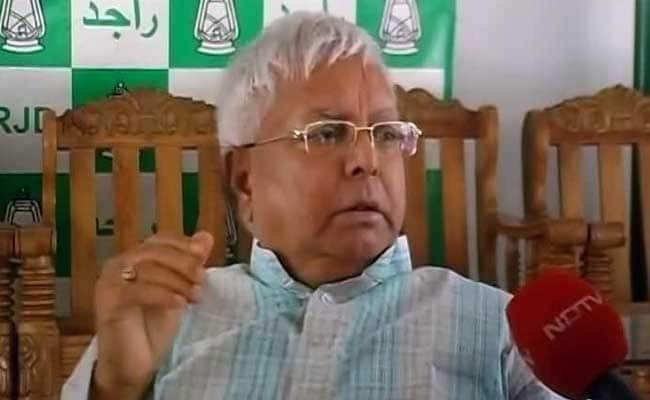 Rashtriya Janata Dal President Lalu Yadav and former Bihar Chief Minister Jagannath Mishra appeared in court in connection with alleged fraudulent withdrawal of Rs 40 lakh from Bhagalpur treasury in 1996. Patna: Rashtriya Janata Dal President Lalu Yadav today appeared in a special Central Bureau of Investigation court here in connection with a multi-crore fodder scam case. Another former Bihar Chief Minister, Jagannath Mishra, and others also appeared in the court of CBI judge Dev Raj Tripathi. Their appearance was in connection with fraudulent withdrawal of Rs 40 lakh from the Bhagalpur treasury in 1996. The court had summoned the accused for personal appearance. A total of 45 people were named as accused in the case. While some of them died during trial, at least 27 people are on trial currently. There are 267 witnesses in this particular case of fodder scam in the Animal Husbandry Department during the RJD's rule in Bihar. Of them, 34 have already recorded statements. Last month, the Supreme Court ruled that Lalu Yadav will have to stand trial in all the four fodder scam cases, setting aside a Jharkhand High Court order that dropped conspiracy charges against the former Bihar chief minister.